Recession of the medial rectus is a measured retroplacement of the muscle from its original insertion. It is the easiest and most effective way of weakening the medial rectus and is the most commonly performed procedure in strabismus management. Its effect is maximal in its field of action and has a significant effect in primary position. Meticulous attention to detail leads to easier surgery, fewer complications, and more predictable outcomes. The image below depicts one of the steps in recession of the medial rectus. Limbal double-winged conjunctival incision and limbal peritomy. Purely refractive accommodative esotropia with normal accommodation convergence to accommodation (AC/A) ratio responds well to single-focus lenses and does not need medial rectus recession unless a nonaccommodative component is also present. This procedure may be performed under local (topical, peribulbar, or retrobulbar) or general anesthesia in an adult but should be performed under general anesthesia in a child. The use of a laryngeal mask enables rapid recovery. Topical and limited local anesthesia may be given postoperatively. Equipment should include a basic muscle surgery set with a good selection of muscle hooks, silk 5-0 stay suture, Vicryl 6-0 for muscle recession, and Vicryl 8-0 for conjunctival incision closure. The patient is positioned such that the head is level and the neck is slightly extended for superior accessibility. The surgeon may position himself or herself superiorly or temporally, ipsilateral to the muscle for recession. The skin within the surgical field should be scrubbed gently with aqueous povidone iodine. The eyebrows should be draped so they are not within the surgical field. The lashes are best covered with Tegaderm prior to application of a lid speculum. A limbal approach for right medial rectus recession is described below. After carrying forced ductions, a silk 5-0 stay suture or Moody forceps is applied on the limbal area at 12 o’clock and 6 o’clock. The globe is then abducted to expose its medial aspect. 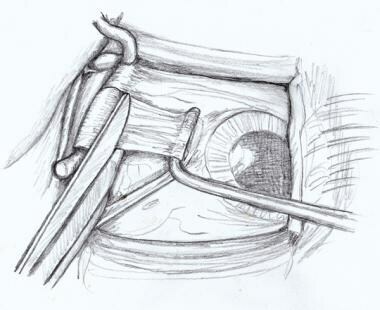 An inferior radial incision is made, and blunt tipped Westcott scissors are used to undermine the anterior Tenon’s capsule and conjunctiva. Then, a limbal peritomy is performed over 4 o'clock hours. Finally, a second radial conjunctival incision is made above and parallel to the first incision (see the image below). 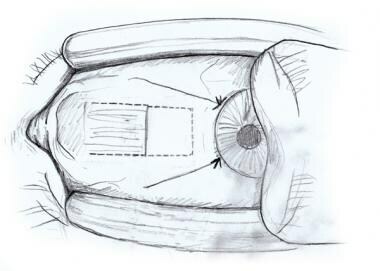 The conjunctiva and Tenon’s capsule are grasped by a tissue forceps in the area of the inferior nasal fornix. The tissues are then pulled straight up to expose the inferonasal quadrant. 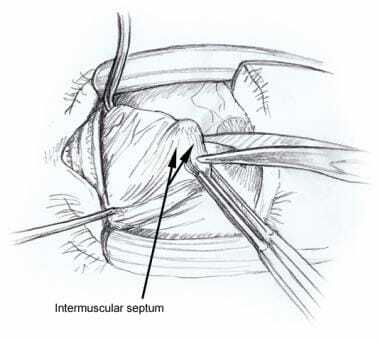 The blunt Westcott scissors are closed, advanced along bare sclera into the inferonasal quadrant, and then spread to open a buttonhole under the intermuscular septum (see the image below). Inferonasal quadrant with Westcott scissors exposing bare sclera. A pair of Lester forceps is placed at the inferior limbus to stabilize and abduct the eye, while the inferior nasal conjunctiva and Tenon’s capsule are grasped with 0.3 Castroviejo forceps and retracted to expose the inferonasal sclera. The inferior pole of the medial rectus is identified by the anterior ciliary artery. Under direct visualization of the inferior pole of the medial rectus muscle, a small Steven’s hook is placed perpendicular to sclera and passed behind the medial rectus muscle (see the image below). Inferonasal quadrant with Steven's hook perpendicular to sclera, just posterior to the muscle insertion. While the small Steven’s hook is under the medial rectus, a large Jameson hook is passed parallel to the muscle insertion line, keeping the tip of the hook down firmly against the sclera until the muscle hook has incorporated the entire width of the muscle. Then the superior nasal intermuscular septum is folded over the tip of the Jameson hook. Intermuscular septum is incised by grasping below the tip of the muscle hook with a Lester forceps and cutting between the forceps and the tip of the muscle hook (see the image below). Westcott scissors about to cut the intermuscular septum grasped by Lester forceps. Using the hole in the intermuscular septum in the superonasal quadrant, the superior pole of the medial rectus and the superior ciliary artery are visualized. The pole test can be performed by placing 2 small Steven’s hooks within the hole in the intermuscular septum and sweeping the anterior muscle hook toward the cornea around the muscle pole. A positive pole test shows the muscle split, and the small hook will be unable to advance anteriorly (see the image below). The anterior Tenon’s capsule in front of the muscle is then removed with Westcott scissors. Light cautery is applied to the anterior ciliary vessels at this point (see the image below). Westcott scissors cutting the anterior Tenon's capsule in front of the muscle. After being cleared of anterior Tenon’s capsule, the Jameson hook is changed with a Chavasse muscle hook and the muscle is secured with a coated double-armed Vicryl 6-0 suture with an s-29 needle. The entire width of the tendon is imagined to be divided into 3 equal segments. The needle is passed through a half-thickness tendon, through the central one-third of the width of the tendon, and exits on the point between the superior and central third of the tendon width. Then the needle is passed through a half-thickness tendon, through the superior half of the tendon width, and exits 1 mm above the sclera. Then the needled is passed through full-thickness tendon to incorporate 2 mm of the edge of the muscle, approximately 1 mm above the sclera. A locking stitch with a twist is performed by passing the suture through the loop. 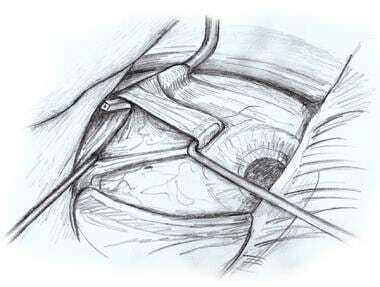 The same procedure is performed with the other needle, along the inferior half of the muscle (see the image below). Muscle is secured with double-armed Vicryl sutures and locking bites at each edge of the muscle. 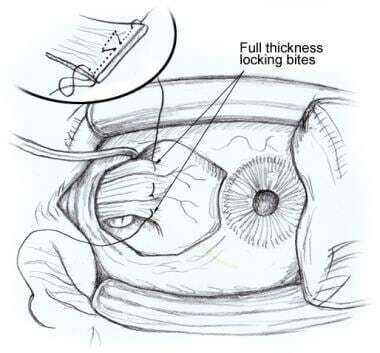 Once the muscle is secured, the preplaced sutures are pulled up gently, keeping them away from the sclera, by placing them between the thumb and index finger. With direct visualization of the insertion, the inferior and superior edge of the insertion is marked with a sterile marking pen, and the muscle tendon is disinserted with Westcott scissors (see the image below). Westcott scissors flat against the sclera disinserting the muscle tendon. 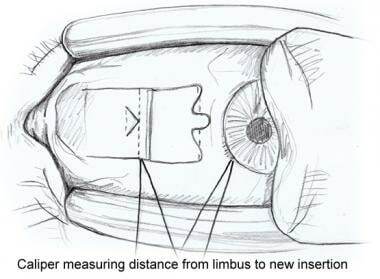 Before anchoring the muscle, the desired amount of recession is measured from the original insertion line or, more accurately, from the limbus using a calliper, and is marked by a sterile marking pen. While securing the globe with a toothed forceps, a scleral pass is made through the superior edge of the original insertion, the needle angled to emerge 1 mm anterior to the middle of the line of insertion. Another scleral pass is made near the center of the insertion line. An identical set of 2 passes are made on the inferior end of the insertion. 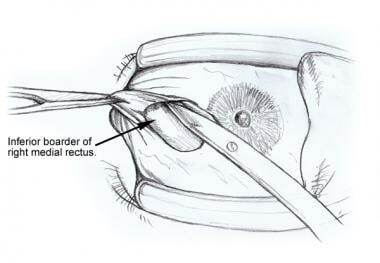 The muscle is pulled up to the level of the desired new insertion, making sure the sutures are taut and the muscle belly spreads nicely against the sclera (see the image below). Checking the position of the muscle before tying the sutures. 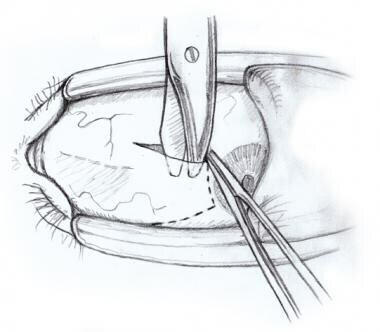 One suture end is cut 3 cm from the sclera, and a knot is tied with a double forehand throw, a single backhand throw, and a final single forehand throw. The sutures are then cut 2 mm from the knot. 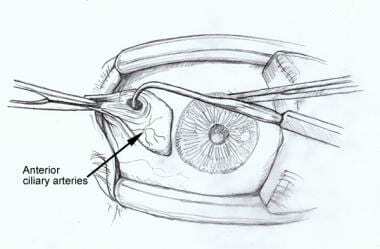 The conjunctiva is then closed with 2 interrupted Vicryl 8-0 sutures (see the image below). Conjunctiva closed with Vicryl 8-0 sutures. Know which conjunctival incision is best to use: Although fornix incision gives you access to the muscle quickest and leaves minimal scarring, it is contraindicated in patients older than 45 years old due to the friability of their conjunctiva. The key in hooking a muscle is to start with the hook perpendicular to sclera, push posteriorly, and turn the corner behind the muscle. Hemostasis makes surgery easier and reduces postoperative inflammation and adhesions. Any source of bleeding should be identified and cauterized prior to suture placement. Careful blunt dissection enables good exposure, limits adhesion formation, and minimizes muscle and blood vessel trauma, as well as fat prolapse. Once the rectus muscle has been exposed, excessive Tenon’s tissue should be excised from its surface to allow accurate placement of sutures without snagging on the suture. Large dissections or cleaning of the intermuscular septum and check ligaments more than 5 mm posterior to the insertion are not indicated and do not enhance the recession. In addition to being unnecessary, excessive dissection may disrupt the normal pulley anatomy. Unlike the other rectus muscles, the medial rectus does not have any direct attachments on an adjacent oblique, making it more difficult to retrieve should it be lost at the time of surgery. Suture placement prior to disinsertion should be 0.5-1 mm from the insertion with secure lock bites at both poles so the whole muscle is incorporated into the suture without any Tenon’s tissue. This minimizes the mount of induced resection and the muscle is secure on the suture and can be disinserted safely, reducing the risk of muscle slippage. Saline irrigation avoids shrinkage of conjunctiva, sclerae, and muscle. A small amount of phenylephrine may be mixed with saline to constrict large vessels. Whether using a single-ended or double-ended suture technique, careful suture placement with accurate knots reduces the risk of sutures looping and muscle slippage. A double-ended suture provides support for the center of the muscle and not just the poles and can be used for most muscle recession including the adjustable kind. Recess the conjunctiva when tight. Conjunctival recession increases the effect of the recession only if the conjunctiva is tight and is causing restriction. In most pediatric cases, the conjunctiva isn't restricted, and recession is rarely needed. In older patients with long-standing large deviations, the conjunctivae may be tight, and conjunctival recession is indicated. Stack RR, Burley CD, Bedggood A, Elder MJ. Unilateral versus bilateral medial rectus recession. J AAPOS. 2003 Aug. 7(4):263-7. [Medline]. Wang L, Nelson LB. Outcome study of unilateral medial rectus recession for small to moderate angle esotropia. J Pediatr Ophthalmol Strabismus. Jan 2011. 1:20-24. [Medline]. Wang L, Wang X. Comparison between graded unilateral and bilateral medial rectus recession for esotropia. Br J Ophthalmol. 2012 Apr. 96(4):540-3. [Medline]. Vroman DT, Hutchinson AK, Saunders RA, Wilson ME. Two-muscle surgery for congenital esotropia: rate of reoperation in patients with small versus large angles of deviation. J AAPOS. 2000 Oct. 4(5):267-70. [Medline]. Forrest MP, Finnigan S, Finnigan S, Gole GA. Three horizontal muscle squint surgery for large angle infantile esotropia. Clin Experiment Ophthalmol. 2003 Dec. 31(6):509-16. [Medline]. Mocan MC, Ament C, Azar NF. The characteristics and surgical outcomes of medial rectus recessions in Graves' ophthalmopathy. J Pediatr Ophthalmol Strabismus. 2007 Mar-Apr. 44(2):93-100; quiz 118-9. [Medline]. Ellis GS Jr, Pritchard CH, Baham L, Babiuch A. Medial rectus surgery for convergence excess esotropia with an accommodative component: a comparison of augmented recession, slanted recession, and recession with posterior fixation. Am Orthopt J. 2012. 62:50-60. [Medline]. Akar S, Gokyigit B, Sayin N, Demirok A, Yilmaz OF. Medial rectus Faden operations with or without recession for partially accommodative esotropia associated with a high accommodative convergence to accommodation ratio. Br J Ophthalmol. 2013 Jan. 97(1):83-7. [Medline]. Mitchell L, Kowal L. Medial rectus muscle pulley posterior fixation sutures in accommodative and partially accommodative esotropia with convergence excess. J AAPOS. 2012 Apr. 16(2):125-30. [Medline]. Wabulembo G, Demer JL. Long-term outcome of medial rectus recession and pulley posterior fixation in esotropia with high AC/A ratio. Strabismus. 2012 Sep. 20(3):115-20. [Medline]. Ribeiro GD, Brooks SE, Archer SM, Del Monte MA. Vertical shift of the medial rectus muscles in the treatment of A-pattern esotropia: analysis of outcome. J Pediatr Ophthalmol Strabismus. 1995 May-Jun. 32(3):167-71. [Medline]. Khalifa YM. Augmented medial rectus recession, medial rectus recession plus Faden, and slanted medial rectus recession for convergence excess esotropia. Eur J Ophthalmol. 2011 Mar-Apr. 21(2):119-24. [Medline]. Kushner BJ. Insertion slanting strabismus surgical procedures. Arch Ophthalmol. 2011 Dec. 129(12):1620-5. [Medline]. Pellanda N, Mojon DS. Minimally invasive strabismus surgery technique in horizontal rectus muscle surgery for esotropia. Ophthalmologica. 2010. 224(2):67-71. [Medline]. Maruo T, Iwashige H, Kubota N, Ishida T, Honda M, Hayashi T, et al. Results of surgery for paralytic esotropia due to abducens palsy. Jpn J Ophthalmol. 1996. 40(2):229-34. [Medline]. Britt MT, Velez FG, Thacker N, Alcorn D, Foster RS, Rosenbaum AL. Surgical management of severe cocontraction, globe retraction, and pseudo-ptosis in Duane syndrome. J AAPOS. 2004 Aug. 8(4):362-7. [Medline]. 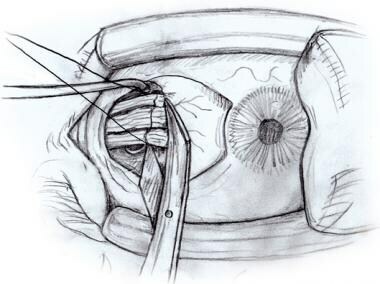 Morris R. Strabismus Surgery. Taylor D, Hoyt C, eds. Pediatric Ophthalmology and Strabismus. 3rd ed. Philadelphia, Pa: Elsevier Saunders; 2005. 962-8. Wright K. Limbal Incision and Rectus Recession. Wright K, ed. Color Atlas of Strabismus Surgery Strategies and Techniques. 2nd ed. California: Wright Publishing; 2000. 81-91. Ferris J, Davies P. Adjustable strabismus surgery. Roy FH, Benjamin L. Surgical Techniques in Ophthalmology. Philadelphia, Pa: Saunders Elsevier; 2007. 39-42. Clark RA, Demer JL. Magnetic resonance imaging of the effects of horizontal rectus extraocular muscle surgery on pulley and globe positions and stability. Invest Ophthalmol Vis Sci. 2006 Jan. 47(1):188-94. [Medline]. [Full Text]. Apt L, Call NB. An anatomical reevaluation of rectus muscle insertions. Ophthalmic Surg. 1982 Feb. 13(2):108-12. [Medline]. Keech RV, Scott WE, Baker JD. The medial rectus muscle insertion site in infantile esotropia. Am J Ophthalmol. 1990 Jan 15. 109(1):79-84. [Medline]. Kushner BJ, Preslan MW, Vrabec M. Artifacts of measuring during strabismus surgery. J Pediatr Ophthalmol Strabismus. 1987 Jul-Aug. 24(4):159-64. [Medline].